The pull between moon and earth causes the sea level to go up and down, in most places twice daily but in some places only once. Very few places don't experience tides at all. It has been a mystery for a long time, and even today is not taught correctly at school. The moon's gravity pulls a bulge of water towards it, compensated by an equal bulge on the opposite side. The moon pulls the earth slightly oval. This buckle in the earth's crust travels at high speed. Tide waves form in a circular motion in the ocean basins. New Zealand is a node for the moon tide, which rotates around it in 12 hours. Tides create a zone where life is difficult. Particularly in estuaries, tides are important. The easiest way to understand tides is shown in this drawing. The earth turns around the sun and is kept in orbit by the gravitational pull between them. Likewise the moon is kept in orbit around the earth by the gravitational pull between these two. Each causes a bulge of water on the nearest side and an equal bulge on the other side. The tide is thus composed of two bulges of water (four, in fact), travelling around the world as the world spins round. When moon and sun are aligned, their respective tide bulges add together to a spring tide every two weeks. When sun and moon are at right angles (the smaller drawing), it causes the bulge of the sun to add to the low tide, resulting in an overall higher low tide but lower high tide. This is called the neap tide, every two weeks in between spring tides. Seen from the north pole, the earth rotates in a counter-clockwise direction: a point on the equator moves east-ward; the sun rises in the east. The tidal bulge thus moves westward. In our solar system, all heavenly bodies rotate in approximately the same plane and in the same direction. The rotation of earth and moon is in the same direction, earth doing its spin in exactly 24 hours and the moon in about 28 days. This difference delays the tide each day by 1/28th day or about 51 minutes. The solar tide is 24 hours. This simple model has been used for centuries to calculate tide levels all over the world but it has a number of insurmountable problems. Wave speed: since the tide is just another gravity wave travelling along the ocean's surface, it must satisfy the laws for waves as explained in the wave chapter. For a wave to travel along the equator of 40,000 km in 25 hours, requires a speed of around 1600 km/hr, which is not sustainable. The maximum wave speed in a 'channel' of 5000m deep is about 800km/hr. Average depth of the ocean is around 3800m, demanding a lower speed still. Bouncing off continents: As the tide wave reaches a continent, most of it will be bounced back off the continental shelf, causing a tide wave of almost equal height to run in the opposite direction. This is not observed in real life. Starting and stopping: as the tide wave apparently needs to start at one continent and stop at the other, it would be larger at the continent where it arrives and smaller where it came from. During the starting and stopping, far too much energy would be wasted. This is not in accordance with tidal movements world-wide. Zero, one and two tides each day: there are places without tide, with one tide and most with two tides each day. This cannot be explained. Tide height: the height of the tide, the difference between high and low tide, does not follow the two-bulge idea which suggests that the tide should be maximal around the equator or on opposite sides of a large ocean. Near the equator one can find places without tides and places with near-maximal tides. Tide timing: high tide occurs at different times of the lunar cycle, depending more on one's place on Earth than on the position of the moon. The balancing bulge on the other side is hard to explain. There is obviously a better explanation of how tides move around the world. From the relative sizes of each component, it can be seen that, should all components work together, the tide could almost double its size during special spring tides. Tide waves follow shorter paths in twelve hour rotations, never exceeding the maximum wave speed of about 800 km/hr. Tide waves do not bounce off continents by hitting them squarely. Instead, they follow along their coasts. There is no starting and stopping but a continuous motion. The standing waves absorb minimal energy. There is no balancing bulge. Instead, tide waves run in twelve hour circles. There can be none, one or two tides per day. The time of high tide depends both on the lunar cycle and the place on Earth. Tide waves are standing waves, expending the least energy. Note that the tide patterns in the oceans are rotating standing waves, not very different from the vibrating of a violin string. Like the fiddlestick of the violonist, stroking the string close to where it is attached, the forces of the moon stroke the ocean's waters into the pattern of standing waves according to the natural resonance periods of the ocean basins. It is thought that this is done by the buckling of the earth's crust. Once the actual oscillation of the sea could be measured, one was able to compare it with calculations from computer models to see if any differences occurred. 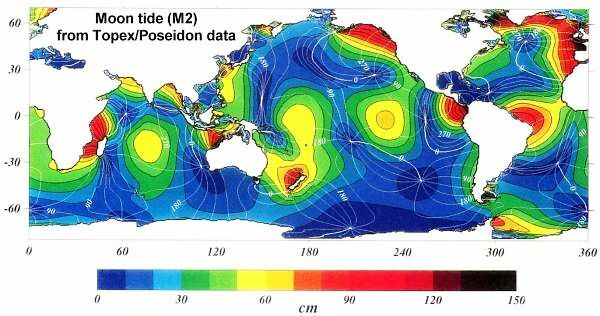 The above picture shows where such tide anomalies occur: around islands where the tide wave distorts most (NZ, Madagascar), and around deep sea ridges and chains of seamounts (Hawaii, Kermadecs). It is now thought that these anomalies give rise to deep eddies that transport nutrients from the deep to the surface, thereby giving rise to unanticipated marine productivity. Note also how some anomalies correspond with already notable fishing grounds. Note also that these computer-generated results must be verified first. Tides dissipate 3.75 ± 0.08 TW (TeraWatt= 1E12 Watt= 1 million million Watt) of power (Kantha,1998), of which 3.5 TW are dissipated in the ocean, and much smaller amounts in the atmosphere and solid earth. The dissipation increases the length of day by about 2.07 milliseconds per century, it causes the semimajor axis of moon’s orbit to increase by 3.86 cm/yr, and it mixes water masses in the ocean. Tides around New Zealand for the main components M2= lunar , S2= solar , O1= lunar declinational, K1= lunar-solar declinational. Would the world be different had there been no tides, no moon? Fortunately, we can find an answer to this question by simply visiting the Mediterranean Sea. This sea is so enclosed and relatively small, that tides don't exist (less than 20cm). Life (for people) is quite pleasant there and the underwater environment counts a high number of species, but the fishery does not sustain large volumes. without tides, dunes cannot form, (see dunes and beaches). Tides expose sea sand to the wind, which blows it into dunes. Dunes help protect the land from the sea. tides condition coasts to wave and tsunami attacks from the sea. Biggest tsunami damage happens where tides are small or nonexistent, such that a tsunami can run far inland (Sumatra,Tokyo). tides create large areas for specialised organisms within harbours and embayments (sand and mud flats, mangroves, etc.). such areas may act as nurseries for various marine species and feeding grounds for others (wading birds and humans). tides create currents that mix the water so that surface plankton is spread and bottom nutrients re-surface. This makes plankton available throughout the year and down to sunless depths. tides create currents that transport plankton to sessile filterfeeders such as clams, sponges, seasquirts, etc, feeding with little effort, thus growing fast. It creates very rich habitats where currents pass. tides create currents that transport and mix coastal sediments. Without them, the coast would be more sensitive to sewage disposal and runoff from the land. It would support fewer people on the land and fewer fish in the sea. -- previous chapter -- next chapter -- .